Aqua Villa is your home away from home in the tropics. Perfect for families. Aqua Villa offers you relaxed luxury & comfort whilst holidaying in Port Douglas, Tropical North Queensland's most desired holiday destination. It is ideal for couples that desire a peaceful and relaxing getaway. It is also a tranquil and secure oasis for families, offering all of the comforts of home after a day at the reef or the beach. A modern children's playground is situated an easy flat 3-4 minute walk from the Villa. A spacious reserve big enough to kick/hit a ball with the family is less than 1 minute walk away. Sit back, relax and enjoy the comforts of home in a single level, spacious, private, secure villa, accentuated by the beauty of the Tropics. Ideally situated, Aqua Villa is 150 m from the world renowned '4 Mile Beach'. The Marina, and lively Macrossan St with its restaurants, shops, and bars, is less than 5 minutes drive or 5-10mins via shuttle bus which stops an easy 250m from the property and runs every 20mins in the peak season. For those that have a car, there is a lock-up garage. Aqua Villa was thoughtfully designed to allow you to enjoy spacious outdoor/ indoor living. Immerse yourself in tropics and enjoy the open plan indoor living with multi-fold doors that open from the living area into a private covered outdoor dining courtyard. Sit back, relax and enjoy a courtyard outdoor BBQ dining experience, surrounded by a tropical garden and over looking the sun soaked plunge pool. The Villa gives you visual access of the sparkling plunge pool from both bedrooms as well as the kitchen and lounge. The Villa features two spacious master bedrooms with separate bathrooms. The 'King Room' is located within the Villa and has a king size bed with your own stunning bathroom. The 'Pavilion Room' is located separately to the Villa, adjacent to the courtyard, giving you the ultimate in privacy. The Pavilion Room has a queen size bed with ensuite and is surrounded by shutters providing you with a beautiful outlook onto the garden and pool. The 'Single Room' is equipped with its own ensuite and is configured with two single beds. At Aqua Villa, all indoor areas are screened, have fans and air-conditioning. A beautiful outdoor undercover area with dining and BBQ overlooks the pool. Surrounding tropical gardens offer the utmost tranquility and privacy for our guests. Beds are freshly made for your arrival with towels. Eco friendly soap. as well as dishwashing tablets and laundry liquid are also provided, as is tea and coffee. There are also beach/pool towels. Please note that bookings are subject to Aqua Villa's terms and conditions, a copy of which is made available prior to payment of the deposit. Please note that this includes a strict no party/function policy. 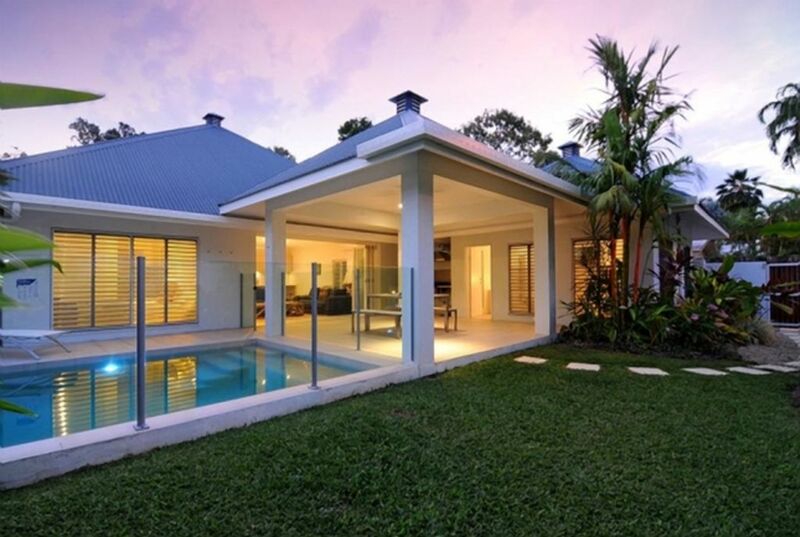 For your added security, this property Aqua Villa Port Douglas is only managed in Australia and we never request payments be made to overseas bank accounts. Airport Transfers as well as limousines can be arranged please please contact us for more information. The house is exceptionally comfortable, clean, spacious and very well appointed. There's a lot of small touches throughout it that all add to it feeling very much like home. A lot of the time while staying in any kind accommodation you find yourself thinking "this place would be good if only it had...." but that was not the case at all here. They had thought of everything. The large kitchen has everything you could want to do any cooking or meal preparation. The lounge room is very comfortable and opens up beautifully to the outdoor area. I also loved the ceiling fan in the main bathroom! Such a great addition for a property in North QLD during summer!! Both Greg and Jessica were very prompt in responding to all queries and were always very kind and keen to assist. Highly recommend this property and would definitely stay here again. The house is exceptionally comfortable, clean, spacious and very well appointed. There is a lot of small touches throughout the property that all add to it feeling very much like home. A lot of the time whilst staying in any kind of accommodation you often find yourself thinking "this place would be great if it only had...." but that was not the case here at all. They had thought of everything. The large kitchen has everything you could want to do any cooking or meal preparation. The lounge room is very comfortable and opens up beautifully to the outdoor area. I also love the ceiling fan in the bathroom! Such a fantastic addition for a property in North QLD during the summer! Both Greg and Jessica were very prompt in responding to all queries and were always so kind and keen to assist. Highly recommend this property and would definitely stay here again! Aqua Villa is just as good in real life as in the photos! Perfectly well presented, with all the creature comforts of home! It was so quiet and the villa is lovely open with that Queensland feel of outside/inside living if you have the doors open all the time! We loved it! Comfy beds, new towels, and kitchen with all the mod cons for eating in too. Beautifully set up and maintained unit with private plunge pool and undercover entertaining and barbecue area. Better than staying at a 5 star hotel in a quite location yet only a short drive to the food and bars of Port Douglas. Aqua Villa was everything and more, for our holiday stay. Attention to detail in all aspects of living, with thoughtful inclusions to simplify our holiday experience. Comfortable bedding and living with TV, Foxtel and free internet. Close to 4 mile beach and near the pick up point for the shuttle. We had a car, but appreciated those heady nights out and not driving. Private, safe and secure, with an amazing outdoor setting, BBQ and delicious swimming pool. If you were interested in fitness, the Ramada Hotel is a short walk and allowed casual membership for $5/visit. Small gym but you could make it work. With a 15 minute walk, the QT had a larger fitness centre for $14/visit. I preferred the Ramada. My only comment would be a mirror in the Pavilion room (other than the bathroom mirror). Us girls like a big mirror and above the entry console would be the perfect spot!! Thank you for 2 hairdryers too! A fabulous home, that missed out on nothing, (other than the big mirror!!) Thanks Greg for your pre contact, during contact and after contact: it made us feel special. It's everything you see in the pictures: a quality holiday home. Thank-you for taking the time to write such a positive and comprehensive review. This will be really helpful for other people when considering their selection of accommodation in Port Douglas. On that front, the shuttle buses on the way home in the evening don't mind dropping you right back to Coral Drive. Just ask them, (sometimes remind them that it runs off Langley Rd) and you always receive a "no problem" response. Thanks for the tip on the full length mirror. We haven't had it raised before, but we will address it. If you come back next year, one will be at the property. It was a pleasure to have your family stay at the Villa and we are delighted that you had a great time. Just a short drive into town and the cnr for the beach and shops this house is perfect. As we walked in the front door the lounge kitchen area is a great open space. The big doors that open to the alfresco letting great light in and a view of the beautiful garden and pool. Bedrooms where great with fans, air con and great bedding. Bathrooms are amazing with everything and wow the kitchen with everything you will need for the stay. Lock up garage was great for us as we had a car and the laundry to wash everything before we went home. The outdoor area was by far my favorite place in the house eating and drinking in the alfresco with a bbq, pool, and amazing garden wow. Thank-you for your comprehensive review Keegan. We are glad you enjoyed your holiday at Aqua Villa. Thank-you for taking such good care of the Villa and leaving it in good order. We hope to welcome you back again.